Samsung is getting about as leaky as OnePlus these days, and there have been all manner of details about the upcoming Galaxy Note9 slipping out over recent days. Now an official image and leaked video show off the handset in all its glory. The Galaxy Note9 is due to be unveiled on August 9, but an image (now removed) that appeared on the Samsung site in New Zealand gives us a great look at what to expect. Even better, a leaked teaser video gives us an even better view showing off a new yellow S Pen, and revealing that the phone is "1 terabyte ready". The image was seemingly posted in error by Samsung as it didn't stick around for long -- but it was online long enough to be spotted and grabbed by serial leaker Even Blass. 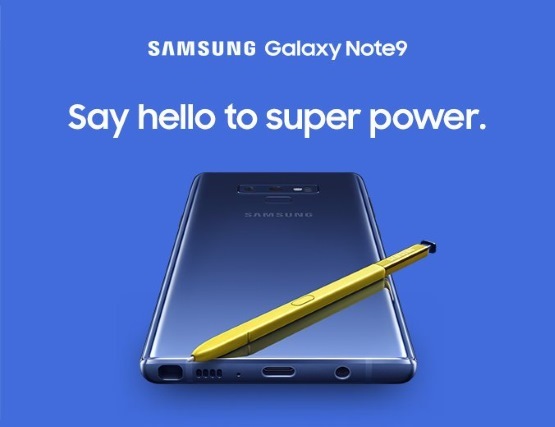 In the image -- which is from a pre-order offer for New Zealand -- Samsung refers to the Note9 as a "super power", and the handset is shown sporting a headphone jack, a rear fingerprint sensor, and a yellow S Pen. In the video, we are treated to a full view of the Galaxy Note9 and some interesting revelations. The video promises all-day battery from the phone, and also shows that a 512GB model will be available -- and with the addition of a 512GB memory card, this means that the handset can have up to 1TB of storage.